No outer plastic outer shell to crack. 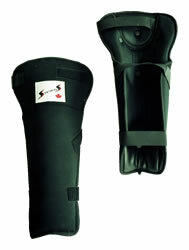 Newly designed elastic straps to loop across the top of the calf to make sure the guard does not slip down the leg. 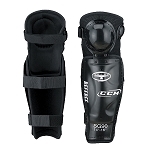 Comfortable padding makes the shin guard a pleasure to wear. 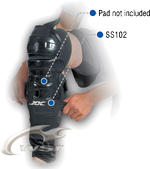 These pads from Stevens are just the right amount of protection and slim-profile needed for officiating. These stay in place and are comfortable. I switched from CCM to these and am very happy with my choice. I have worn these pads for many years. They are low profile, but offer plenty of protection. I ref everything from little kids to NA3HL and would recommend these to anyone! Ive been wearing these for 5+ seasons with no problems. they are comfortable, offer plenty of protection and stay put. No need for any extra tape or strap when using shin tights.